St. Paul’s Heritage Preservation Commission (HPC) voted 8-1 to recommend the former St. Andrew's church building as a Heritage Preservation Site. The Minnesota State Historic Preservation Office (SHPO) supported this decision, and concurred that “St. Andrew’s Church is an ideal candidate for local designation.” These votes confirms that the St. Andrew's church building is historically significant and eligible for protection as a historic landmark. St. Andrew’s is an example of the “Romanesque Revival Style,” reminiscent of the architecture that first developed in Europe in the 9th through 12th centuries. St. Andrew’s is not only significant in the Como Lake area but is also among the most distinctive neighborhood churches in St. Paul. As a St. Paul Heritage Preservation Commissioner noted during the public hearing that declared St. Andrew’s eligible for designation: “We once had eleven historic synagogues in St. Paul. They fell one by one, and no one noticed because there were always a few left. Now there are none.” Shortsightedness failed our future and scrubbed away part of St. Paul’s history. In a community, people come together to collaborate and communicate. Unfortunately, the community was not invited to participate in the planning or decision-making by the Twin Cities German Immersion School. Key decisions have been made during facilities meetings and strategic retreats, and the community has been informed of these decisions rather than included in the discussions. Save Historic St. Andrew’s wants to work with TCGIS, but the school has to be willing to collaborate with those who may offer different perspectives and solutions. An example of what community engagement should not look like is TCGIS’s efforts to demolish the church belltower during MEA week. This plan, developed on short notice, was revealed to members of SHSA without any effort to engage them or the community as to why this “partial demolition” needed to take place. Later, SHSA found out, only via a request through the MN Data Practices Act, that this rushed partial demolition was being pursued to save an $1,000 on a project with a total estimated cost of $6 million. Fortunately, the City of St.Paul did not allow this proposed demolition to move forward, because TCGIS did not have the proper demolition permits. The Como-Warrendale community needs to be a part of the process to manage the community’s historic resources. We do not accept the current model in which TCGIS ignores the community, and refuses to collaborate. For years the Warrendale neighborhood has had to contend with traffic congestion, significant parking pressure, and often-unsafe traffic conditions. We have tried repeatedly to work with TCGIS through the District 10 council to improve neighborhood relations but met with very little or no success. Expansion of the school and it’s population on a small, condensed residential site situated directly adjacent to 13 homes will only exacerbate these existing issues. There are also no large outdoor playgrounds to buffer traffic and noise generated during the day at TCGIS. TCGIS is seeking three variance requests related to parking, lot size, and building height. While the percentage variance for the height and lot size of the proposed new building seems minimal, what is being requested is actually quite substantial: the destruction of an eligible historic resource and iconic neighborhood fixture, the former St. Andrew’s church. If these changes are permitted, they will forever alter the essential character of the Warrendale neighborhood while also burdening the community with additional traffic and increased pressure on available parking spaces. In comparison to other schools in the area, TCGIS supports significantly more students on a significantly smaller site. As noted in SHSA’s appeal to the Planning Commission, if the TCGIS proposal were to be approved, it would have 375.1 students per acre, by far the highest density of any St. Paul elementary and middle school in R1-R4 zoning. For perspective, the next highest density school is the Achieve Language Academy, which has 270 students per acre. TCGIS’s desire to boost student density on such a limited space within a residential neighborhood is problematic for the neighborhood, and creates a host of problems for homeowners and community members. St. Andrew’s church thrived for 100+ years, and its landmark sanctuary has stood at the center of our community since 1927. St. Andrew’s served generations of neighbors, immigrants, and students. Whether a church or school, this historic place has meaning; it is a active, beautifully preserved piece of the Warrendale community’s history. The Warrendale neighborhood without St. Andrew’s at its heart is unimaginable. 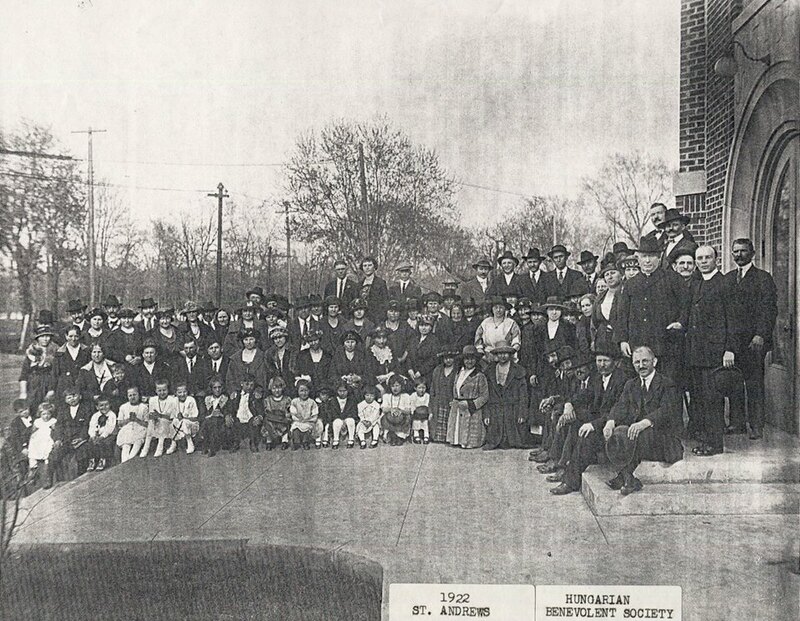 St. Andrew’s played a significant role in the lives of the working class Hungarian community that made up its early congregation, and was an instrumental part of the Hungarian immigrant experience. Associated Hungarian benevolent societies helped immigrants adjust to neighborhood life. Demolition of St. Andrew’s will permanently alter the historic fabric of this long-established neighborhood. St. Andrew’s has been a symbol of strength for almost a century. TCGIS continues to argue that St. Andrew’s no longer holds value to the community because it is no longer an active parish. In their Nov. 5 presentation to the Heritage Preservation Commission, their board argued that “heritage follows a Parish, not the building” and “the parish is what retains the history, culture, heritage, and legacy; The church does not.” This could not be further from the truth. The former St. Andrew’s church building carries meaning for many community members, irrespective of religious belief. In fact, the vast majority of the volunteers within SHSA do not have, and never have been affiliated to the former church. TCGIS is attempting to present a narrative of preservation as a strictly religious issue, and this is incorrect. Preservation is of the church is about community identity and heritage, it is about St. Paul’s architectural history, it is about the management of of our city’s historic resources (particularly as they relate to publicly-funded schools). St. Andrew’s is very much a living historic resource. TCGIS spent millions of public funds renovating the former church as a gymnasium and cafeteria, turning the former rectory into a parking lot, and adding an extension to the existing school in 2013, presumably without long-range forecasting that might have anticipated growth. As far as we can tell, nearly every other charter like TCGIS that has grown its population has relocated to a larger building or site—including Higher Ground Academy, NOVA, Twin Cities Academy, etc.—rather than tearing down a historic building. The French and Chinese immersion programs within SPPS have also relocated several times. Five years later, TCGIS wants to spend more taxpayer money to demolish the very building it purchased and rehabilitated with public funding. As a public charter school, TCGIS needs to be made accountable to the public. It received $8.5 million in conduit bonds in 2013, and $5.9 dollars in state funds for 2017-18. These are very significant sums of money, and there are serious concerns regarding the school’s use of these public funds to attempt destroy an historic building (especially after having used part of the public funds to renovate and restore the church in the first place). We demand accountability, and a more appropriate use of taxpayer dollars. The claim that St. Andrew’s is an “energy-inefficient” building is a developer’s tactic, and is very misleading. The energy required for demolition, removing debris and building materials, transporting new materials to the site, and actually constructing a new building far exceeds any energy efficiency that would be achieved by tearing down the former church building and constructing a school building in its place. Planting rain gardens, adding green space, and recycling aluminum cans are environmentally sound practices. Demolishing the St. Andrew’s building is not. Make no mistake — the proposed demolition of the St. Andrew’s church building has nothing green about it. “When comparing buildings of equivalent size and function, building reuse almost always offers environmental savings over demolition and new construction.” — from The Greenest Building: Quantifying the Environmental Value of Building Reuse, National Trust study. According to the Minnesota Pollution Control Agency, more than 80% of Minnesota’s 1.6 million tons of construction and demolition waste ended up in a landfill in 2013. St. Andrew’s demolition would generate thousands of tons of landfill. Once the wrecking ball swings, it is too late. Every effort must be made to find alternative solutions before that point of no return. That takes time and open cooperation as opposed to a singular focus on demolition. The other pressing question is: what happens if TCGIS demolishes St. Andrew’s and later decides to move? In this neighborhood, we are well aware of the changing educational environments that lead schools to move. This has already happened at the TCGIS site with St. Andrew’s school, which was replaced by the French Immersion School, which was replaced by TCGIS. The idea that any charter school will have a permanent site is simply naive, and overlooks the wealth of data regarding charter school closures and location changes. This concern is augmented for TCGIS, which, if its proposal goes through, will have by far the highest student density per acre of any elementary school or middle school in St. Paul, while maintaining increasing enrollment pressures. It is not hard to envision the common scenario where TCGIS moves. On the other hand, demolition is permanent, and would remove a treasured community landmark and historic resource.